Owing to our expertise in this domain, we are highly engaged in providing a wide array of Bronze component to our esteemed patrons. The offered screws are manufactured using optimum quality basic material and sophisticated techniques by our adroit professionals in tune with industry norms. The offered screws are widely appreciated by our precious clients owing to its easy installation and best finish. We mfg all of brass bush . We mfg premium quality. With workable rate. bush made BY CNC & VMC. Bronze Components offered can be made available by us in complete range of finish choices including material grades as well as in different size and surface finish choices to pick from. 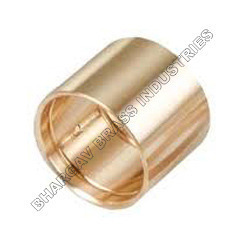 Made available in different bronze grades, these also assure of long-lasting usage. Some of its features include recognized for high performance support; provide for maximum wear resistance; offering longer service life and consistent usage; providing for maximum wear resistance; coming developed using advanced production techniques and quality approved processes; available in different finish sizes as demanded by the customers. Looking for Bronze Component ?